Is the difference between a psalm, a hymn, and a spiritual song/song from the Spirit defined anywhere in scripture or church tradition? Paul's Greek was ψαλμοις, υμνοις and ωδαις πνευματικαις. ύμνος, -ου, ο, in Greek writing from Homer down, a song in praise of gods, heroes, conquerors, [cf. Trench as below, p297], but in the Scriptures of God; a sacred song, hymn. ύμνος, ψαλμός, ωδή: ωδή is the generic term; ψαλμός and ύμνος are specific, the former designating a song which took its general character from the Old Testament "Psalms" (although not restricted to them, see 1 Cor 14:15, 26), the latter a song of praise. 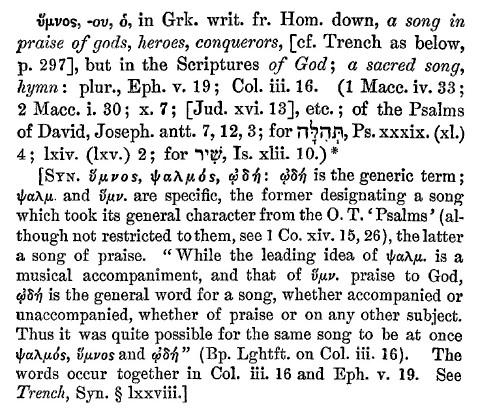 "While the leading idea of ψαλμός is a musical accompaniment, and that of ύμνος praise the God, ωδή is the general word for a song, whether accompanied or unaccompanied, whether of praise or on any other subject. Thus it was quite possible for the same song to be at once ψαλμός, ύμνος, and ωδή" (Bishop Lightfoot on Col 3:16). The words occur together in Colossians 3:16 and Ephesians 5:19. See Trench, Synonyms §78. Songs from the Spirit - Since there is no definition for this, I've always seen it as being lead to do either 1 or 2 by a prompting of the Holy Spirit. Not the answer you're looking for? Browse other questions tagged church-history hymns music psalms or ask your own question. What is the oldest hymn (with music) that is still sung in churches today? Psalm 14 and psalm 53 are similar? What is Matt Redman's denominational background? Why does only one person “teach” during a church meeting? Eastern Orthodoxy - When a liturgical hymn to a Saint is composed (such as a Troparion), how is the mode/tone for the hymn chosen? When were “psalms and hymns and spiritual songs” in Colossians 3 first argued to refer only to the Book of Psalms? According to Catholic theology are the Psalms suitable preaching/prayers/songs for Christians?